Nancy Jammu-Taylor joined the McTague Law Firm in 2003 and became a partner in 2008. Ms. Jammu-Taylor practices in the Employment and Labour Law Department and primarily represents employers with respect to collective bargaining, grievance arbitrations, judicial review applications, Labour Relations Board matters, including applications under the Public Sector Labour Relations Transitions Act, and Human Rights Code proceedings. 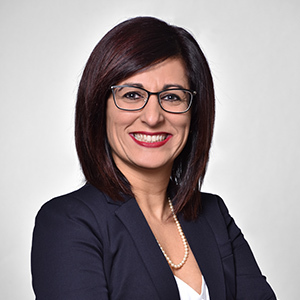 She also has experience with wrongful dismissal matters and Employment Standards Act proceedings and has assisted employers in conducting workplace investigations, particularly regarding allegations of harassment, including sexual harassment, and workplace violence. Ms. Jammu-Taylor has provided training to employees on workplace harassment and violence in accordance with the Occupational Health and Safety Act. In addition, Ms. Jammu-Taylor has represented clients in the health care industry at Consent and Capacity Board matters. University of Detroit Mercy (M.A.,1999), University of Windsor (LL.B., 2002); admitted to the Ontario Bar, 2003.